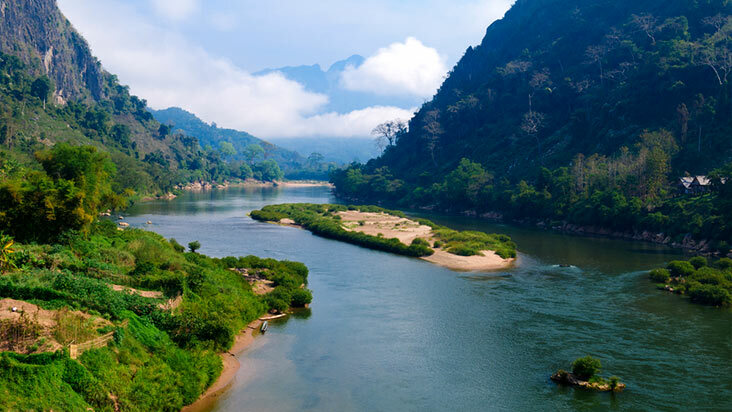 Northern Laos is a mountainous tapestry of rivers, forests and traditional villages, home to many different ethnic minorities including Tai Lue, Khmu, Lao and Hmong. Life is very simple here and depending on the season you may encounter the local villagers harvesting river weeds, distilling Laos whiskey, fishing with nets or harvesting river shrimp, a local speciality. At Nong Khiaw limestone peaks and towering cliffs rise dramatically from the Nam Ou riverbed. Muang La is a Thai Lu village sitting at the confluence of the Nam La and Nam Phak rivers. 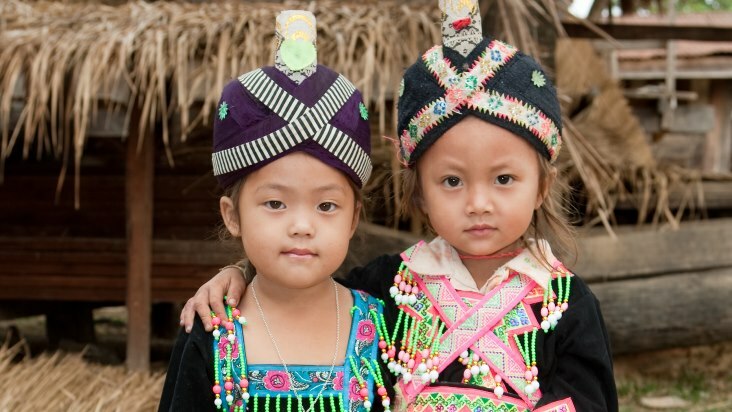 Explore the remote villages and the spectacular scenery in this untouched part of Laos. Travel with your guide from Luang Prabang into northern Laos to the village of Nong Khiaw, where limestone peaks and towering cliffs rise dramatically from the Nam Ou riverbed. Close to Nong Khiaw is Tham Pha Thok, a series of caves in the limestone cliff where villagers and provincial government officials lived during the Second Indochina War to avoid bombings. Northern Laos is a mountainous tapestry of rivers, forests and traditional villages, home to many different ethnic minorities including Tai Lue, Khmu, Lao and Hmong. 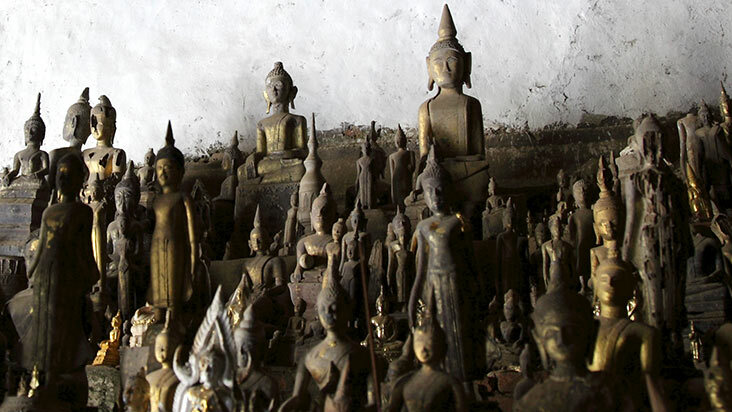 Set off from Luang Prabang and visit the mysterious and sacred Pak Ou Caves en route. The Pak Ou Caves are dramatically located in a limestone rock formation opposite the mouth of the Mekong and Nam Ou rivers. The sanctuaries of Pak Ou consist of two large caves cut into the limestone cliff to reveal hundreds of Buddha effigies of various styles and sizes, from the tiny to the colossal and spanning many centuries. The road takes you through farmland and stunning mountainous scenery with the road following the Mekong and then the Pak Ou rivers. Stop in Ban Nambak to explore the local market before continuing to Nong Khiaw, set on the banks of the Nam Ou River. Enjoy free time on arrival for remainder of the day. Your guide will provide restaurants recommendations for tonight. Itinerary Option: For additional adventure, upgrade to travelling by river rather than by road. Set out this morning with your guide by local boat along the picturesque Nam Ou River. Admire the breathtaking scenery and the limestone karst landscapes as you travel downstream to Ban Sopkhan, a Lao Loum (lowland Lao) village. Spend some time here to understand the local people and their lifestyle. Continue hiking for a couple of hours through rice fields to Ban Pha Yoong, a Hmong ethnic village, and Ban Tad Lene, a Khmu village. Here a picnic lunch will be served before heading back to Nong Khiaw. We depart early for your drive to Muang La. This route is particularly good for its mountain views and remote Hmong villages, including Ban XongJa. We continue to Muang La, arriving there in time for lunch. Enjoy the rest of the day at leisure in your beautiful resort. After breakfast, transfer to the riverside and board our local private boat for an unforgettable cruise up the Nam Ou River to Muang Kua. This particular stretch offers stunning lime-stone scenery and remote villages; including Ban Sob Jaem where the villagers produce traditional Lao skirts and which can only be reached by boat. After around 2 hours we disembark and board a tuk-tuk for a short trip to pass the new Nam Ou Dam, before boarding a second boat for the 2½ hour upstream part of the boat journey. Enjoy a tasty picnic lunch on the way, before we reach Muang Kua by mid-afternoon. From here we drive in 1,5 hours to Muang La. The rest of the day is at leisure at your peaceful resort. Rest of day depends on main itinerary. Discuss options with our staff. Explore the area around Nong Khiaw and Muang Ngoi including a cave and Ban Sopjam, a Khmu and Lao village. Ban Nayang with overnight homestay. Trek to Ban Phavie, a Khmu village and on to a waterfall. Enjoy a sunset dinner on the private river island of Muang La Resort. Other options include longer treks, cycling, kayaking and rock climbing.